Leah Niederstadt, Assistant Professor of Museum Studies and Art History, had her article published in the journal African Arts. African Arts is published by the James S. Coleman African Studies Center and distributed by MIT Press. The journal focuses on research and discourse on the topic of the arts in Africa and from the African diaspora. 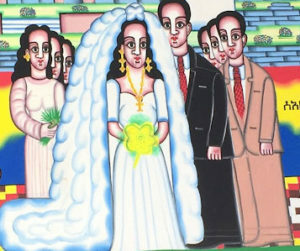 Niederstadt’s article is titled “Visualizing Marriage in Northern Ethiopia: The Production and Consumption of Gama” and is about the painting genre called gama. Gama is Tigrinya for wedding, and the genre always depicts a bride and a groom, sometimes with their attendants, alongside structures and objects from Aksum, the birthplace of the Ethiopian Orthodox Tewahedo Church. These paintings are typically done by priest-painters of the church and are treated similarly to a marriage certificate. A gama represents tradition and the covenant between the married couple and their families. At the bottom of the painting is a section where the names of the couple and date of the wedding are displayed, although in some paintings this information is painted onto the picture. For the image at the top of this post, Niederstadt photographed two people holding up a gama. 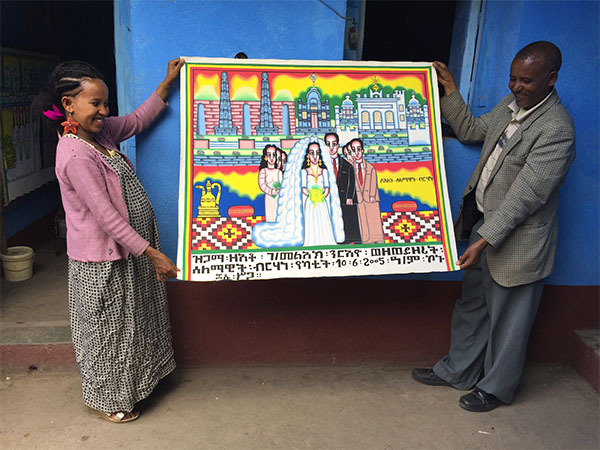 On the left is Selamawit Berhane, who painted the gama for her wedding to Gebre Melak Nirayu. On other side is her father, Liq Berhanat Berhane, who taught her how to make these paintings. Liq Berhanat is an honorary title for priests meaning Chief of the Light. Many of the photos in Niederstadt’s article were taken by her. Niederstadt is also curator of the permanent collection here at Wheaton. She has a chapter in a new book Is it OK to Sell the Monet? 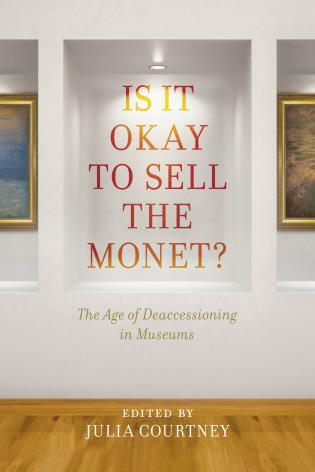 The Age of Deaccessioning in Museums, edited by Julia Courtney. Her chapter, entitled “Building a Legacy for the Liberal Arts: Deaccessioning the Newell Bequest, Wheaton College”, is about selling the Newell Bequest from our collection to raise funds. The book is about how and why more and more museums have started this process of deaccessioning. Her chapter is a strong contribution to the guidance on how to deaccession and when it is ethical to do so. Niederstadt’s chapter is the first of several case studies in the last part of the book which analyzes high profile museums facing the need to deaccession.